On March 26, 2012, a team of astronomers using NASA's Wide-field Infrared Survey Explorer (WISE) submitted a pre-print which revealed a very dim and cool, T8.5 brown dwarf (designated WISE J111838.70+312537.9) that exhibits common proper motion with this multiple-star system. With an angular separation from the primary of about 8.5 arc-minutes, the astronomers estimated a wide physical separation of about 4,000 AUs. Supporting earlier analyses, the sub-solar metallicity and low chromospheric activity of the primary (Xi UMa A) suggest that that the system is at least two billion years old. Based on the infrared luminosity and color of the substellar object, the mass of this brown dwarf is estimated to be between 28 and 58 Jupiter-masses based on an estimated age of the star system of between two and eight billion years (Wright et al, 2012). as of March 26, 2012 (more). Initial, space-based parallax measurements by the HIPPARCOS Mission proved to be "confused" by the short-period ("curious epicyclic") motions of this multiple star system (R. F. Griffin, 1998). To improve statistical reliability, NASA's NStars Database averaged ground-based measurements (1995 Yale Parallax Catalogue) with modified HIPPARCOS (Staffan Soderhjelm, 1999) to provide a revised distance of about 27.3 light-years from Sol. The system lies in the southern part (11:18:10.94+31:42.2:C~, ICRS 2000.0) of Constellation Ursa Major, the Great Bear, which also encompasses the Big Dipper or Plow (Plough) -- south of Alula Borealis (Nu Ursae Majoris). The two bright stars of the system were discovered on May 2, 1780, by Sir William Friedrich Wilhelm Herschel (1738-1822, portrait), who was born Friedrich Wilhelm Herschel and who discovered the planet Uranus in 1781 -- which led to his appointment in 1782 as private astronomer to the King of England. Their relative positions were first accurately measured in 1826 by Friedrich Georg Wilhelm von Struve (1793-1864), who became director of Russia's Dorpat Observatory in 1817 and founded and directed the Pulkovo Observatory in 1837. (Struve also surveyed 120,000 stars from 1819 to 1827, published an extensive monograph of Halley's Comet based on observations in 1835 and his findings on 2,640 double stars in 1837, and measured the parallax of Vega from 1835 to 1838.) Because the relative motion of the brighter components implied actual physical association rather than coincidental visual alignment, Félix Savary (1797-1841) was inspired to calculate the first orbit ever for a "double star" by applying Newton's "laws of gravity" in 1828, whose solution was subsequently provided by Herschel in 1829. A summary with more information on the history of astronomical investigations into this multiple star system from 1780 to recent years can found in R. F. Griffin (1998). This star is a yellow-orange main sequence dwarf star of spectral and luminosity type F8.5-G0 Ve, with about 105 percent of Sol's mass (Wulff Dieter Heintz, 1996), 97 percent of its diameter (Johnson and Wright, 1983, page 671), and about 1.1 times its luminosity. It may be nearly (98 percent) as enriched as Sol with elements heavier than hydrogen ("metallicity"), based on its abundance of iron (Cayrel de Strobel et al, 1991, page 291). Compared with Star B, Star A has a high lithium abundance. Given its relatively low chromospheric activity and the similarity of its Ca-II lines to Sol's, the system is likely to be more than two billion years old (Strobel et al, 1994). The star is a New Suspected Variable designated NSV 5165. Useful star catalogue numbers for the star include: Xi/Ksi UMa, 53 UMa, HR 4375, Gl 423 A, Hip 55203, HD 98231 A, BD+32 2132 A, SAO 62484, LHS 2390, LTT 13045, LFT 790, Struve (Sigma) 1523, ADS 8119 A, and BDS 5734. Spectroscopic and astrometric analyses reveal a companion Ab. First detected as a periodic orbital perturbation in 1905 by N. E. Norlund, this companion has been cited by the Sixth Catalog of Orbits of Visual Binary Stars as being separated "on average" from Star Aa by a semi-major axis of 0.054", which may be a misinterpretation of Heintz (1996). In any case at a distance of about 27.3 ly, with a period of 1.834 years and a combined mass for Aab of around 1.45 Solar-masses, the semi-major axis should be around around 1.69 AUs wide. The two stars have a highly elliptical orbit, and more recent radial velocity analyses suggest that the eccentricity is closer to 0.53, rather than the 0.61 value derived from visual observations (Griffin, 1998). Hence, Aa and Ab may move as close as 0.8 and as far as 2.6 AUs, at an inclination from the perspective of an observer on Earth of 91° (Heintz, 1996). The orbit of an Earth-like planet (with liquid water) around this tight binary (Aab) would have to be centered around 1.3 AUs -- between the orbital distances of Earth and Mars in the Solar System -- with an orbital period between one and two Earth years. Given that the closest separation of the stars in the binary pair Aab is around 0.8 AU (given an ecccentricity of 0.53), however, such a planetary orbit appears unlikely to be stable. Furthermore, the noncoplanarity of the orbits of star pairs Aab and Babc? reduces the likelihood of stable planetary orbits at increasing distances from each star or binary pair (Alan Hale, 1994). Gliese 623 A (M2.5V) and B (M5.8Ve) at lower right. This companion object appears to have about four-tenths of Sol's mass according to Heintz (1996), which would correspond with a star around spectral type M3 (Mason et al, 1995). It may have around one percent of Sol's luminosity. Despite its faintness, its radius may be half as great as star Aa (Griffin, 1998, page 20). This star is a yellow-orange main sequence dwarf star whose spectral and luminosity type has been estimated in the range from G0-5 Ve. The star may have about 90 percent of Sol's mass, 91 times of its diameter (Johnson and Wright, 1983, page 671), and 67 percent of its luminosity. It is about 300 °K cooler than Star Aa. Star Ba may be only 76 percent as enriched as Sol with elements heavier than hydrogen ("metallicity"), based on its abundance of iron (Cayrel de Strobel et al, 1991, page 291). Moreover, the star seems to be depleted in lithium because it has maintained comparably dynamo-induced, chromospheric activity resulting from a relatively fast, synchronous (tidally-locked) rotation with its companion and so it may have lost about 10 percent more of its matter than would a single star of its mass and age (Strobel et al, 1994). 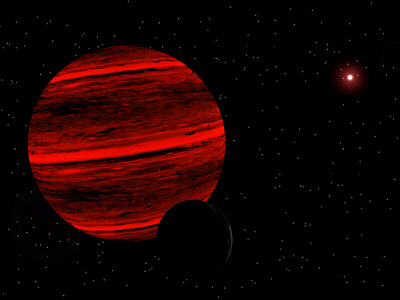 Star Ba may have a brown dwarf companion (see Bb below) in a "torch orbit," with an average separation of 0.06 AU in a highly circular orbit (e=0.00) whose period is completed within four days. The orbit of an Earth-like planet around the tight binary system that star Ba forms with its brown dwarf companion in the liquid water zone would have to be centered around 1.1 AU -- a little farther than Earth's orbital distance around Sol -- with an orbital period exceeding one Earth year. However, if the existence of a relatively close, second companion (see Star Bc below) around Bab -- with an orbital period of 2.2 to 2.9 years or less -- is confirmed, then a planetary orbit in Star Ba's water zone may not be stable over the long run. Useful catalogue numbers for this star include: HR 4374, Gl 423 B, HD 98230, and LHS 2391. -- like Gliese 229 b with its own dark satellite, as imagined by Whatmough. This low-mass companion was discovered using radial velocity measurements in 1996, possibly confirming Louis Berman's discovery of a spectroscopic companion to Star B in 1931. It has at least 37 times the mass of Jupiter and a circular orbit (e~ 0) with a period of 3.98 days with a semi-major axis of ~0.06 AUs. A recent analysis of radial velocities, however, discusses the possibility of a Bb companion as a orange-red (late K-type) dwarf star based on suspected mass ratios among the binary pairs without any mention of the 1996 brown dwarf finding (Griffin, 1998, pp. 293-294). According to James Kaler, however, "Variations caused by surface activity lead to a rotation period of 4.0 days, which when compared with the projected equatorial velocity (2.8 kilometers per second) allows the axial and presumably orbital tilts to be found, which in turn allows for a true estimation of mass and shows the dim companion to be a cool-end class M dwarf with a mass of 0.15 Suns, placing it well above the brown dwarf limit of 0.075 solar masses ..." (more). Past calculations of orbital elements and system mass ratios based on astrometry -- and other visual observations -- and the spectral type of Star Ba (G0-5) indicate that Xi Ursae Majoris Bb is not massive enough to fully account for subsystem B (e.g., Wulff Dieter Heintz, 1996, page 411), and suggest the existence of a stellar companion (i.e., Bc). at left center of meteor. Analysis of only one of 27 speckle interferometric observations (obtained with Kitt Peak and Canada-France-Hawaii telescopes) uncovered a fifth visual component to this multiple system (Mason et al, 1995). This object, however, apparently "never [has] had any effect whatsover upon the astrometric and radial-velocity behaviour of the observable components whose existence is reliably established" Griffin, 1998), pages 275-276). The star may be an orange-red, main sequence dwarf of spectral and luminosity type K2-3 V and have an orbital period with Star Ba or 2.2 to 2.9 years. Subsequently, Heintz (1996, page 411) suggested that such a companion to Star Ba would have to have a mass of at least half Sol's to reach detectable brightness, and that, among other orbital requirements, Bc's period would have to be less than an Earth year in order to account for the absence of effects on Ba's radial velocities and positions. When brown dwarfs were just a theoretical concern, astronomers differentiated those hypothetical objects from planets by how they were formed. 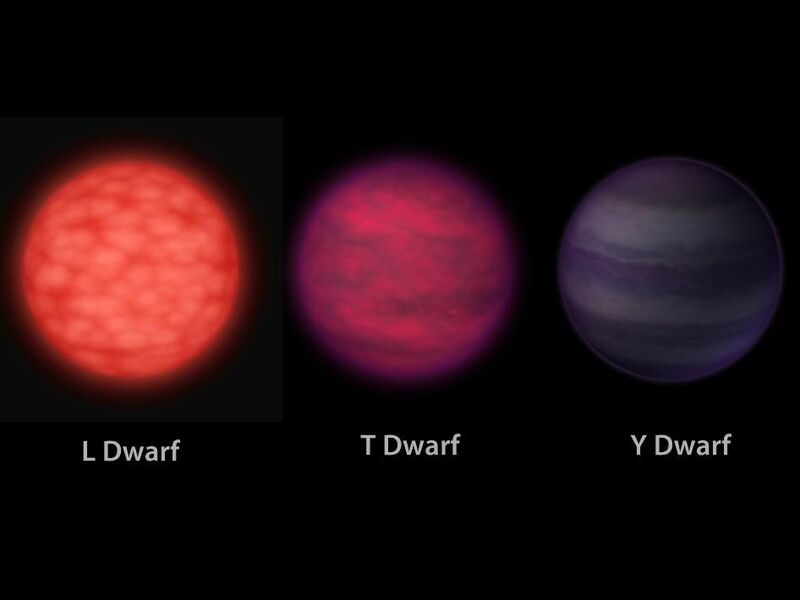 If a substellar object was formed the way a star does, from a collapsing cloud of interstellar gas and dust, then it would be called a brown dwarf. If it was formed by gradually accumulating gas and dust inside a star's circumstellar disk, however, it was called a planet. Once the first brown dwarf candidates were actually found, however, astronomers realized that it was actually quite difficult to definitely rule on the validity of competing hypotheses about how a substellar object was actually formed without having been there. This problem is particularly difficult to resolve in the case of stellar companions, objects that orbit a star -- or two. diameter and may contain many of the same atmospheric molecules. University of California at Berkeley astronomer Ben R. Oppenheimer, who helped to discover Gliese 229 b, is part of a growing group that would like to define a brown dwarf as an substellar object with the mass of 13 to 80 (or so) Jupiters. While these objects cannot fuse "ordinary" hydrogen (a single proton nucleus) like stars, they have enough mass to briefly fuse deuterium (hydrogen with a proton-neutron nucleus). Therefore, stellar companions with less than 13 Jupiter masses would be defined as planets. Other prominent astronomers, such as San Francisco State University astronomer Geoffrey W. Marcy who also has helped to discover many extrasolar planets, note that there may in fact be many different physical processes that lead to the formation of planets. Similarly, there may also be many different processes that lead to the creation of brown dwarfs, and some of these may also lead to planets. Hence, more observational data may be needed before astronomers can determine how to make justifiable distinctions in the classification of such substellar objects. The following star systems are located within 10 light-years, plus more bright stars within 10 to 20 ly, of Alula Australis. Up-to-date technical summaries on these stars can be found at: the Astronomiches Rechen-Institut at Heidelberg's ARICNS, the NASA Exoplanet Archive, and the Research Consortium on Nearby Stars (RECONS). Additional information may be available at Roger Wilcox's Internet Stellar Database. Constellation Ursa Major is only visible from the northern hemisphere. The seven stars of the Big Dipper in this constellation are famous as the traveller's guide to Polaris, the North Star. For more information about the stars and objects in this constellation, go to Christine Kronberg's Ursa Major. For an illustration, see David Haworth's Ursa Major. Note: Special thanks to Andrew Tribick about the 2012 discovery of a T8.5 brown dwarf and to David Bellomy for pointing out the implausibility of the reported semi-major axis for the inner binary pair Aab and encouraging us to derive a more plausible, average orbital separation.